Find out the differences between the available roulette versions today here: American table, French, European and more. Roulette is actually a French term that means "small wheel". 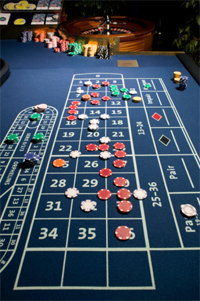 Originally, this famous European game was called "French roulette". In fact, it was so popular, it was played all over Europe in the 1900s. Today, practically every table of French roulette all over the world plays the European version as opposed to the American one. The table layouts of American and European roulette are almost the same. There is only one big difference: European tables only have one zero on them, while American tables have two. Another big difference lies in the number sequence on the wheel, which are completely different from one another. French roulette only has a single zero, too. However, the layout of the table is a bit different. It is also wider and players do not get individual coloured chips. Instead, they use cash chips. Also, the dealer, or stick-man, uses a stick to announce which number won, to gather table chips, and to give winners their winnings. Because of this, the game is physically slower compared to American roulette overall. In European and American roulette, every player gets individual coloured chips and once the results are announced, the chips that were lost are gathered by hand. The same goes for paying out the winnings. This makes the game much faster compared to French roulette. When it comes to French casinos, they refer to all roulette games with two zeros as "American roulette". Conversely, roulette tables with a single zero are called English roulette, which makes it completely different from the 00 roulette and emphasises the single zero that is used in England. Actually, in a lot of countries (such as in England), single-zero roulette is known as American roulette in order to set it apart from French roulette and because of how the game goes during play. In several African countries, it has a more complex name: roulette on an American table with French numbers.